At its regular monthly meeting of January, the Front Royal-Warren County Economic Development Authority revisited discussion at a special meeting a week earlier about the authority’s ongoing ownership of the old Stokes Mart building now housing the Main Street Market. 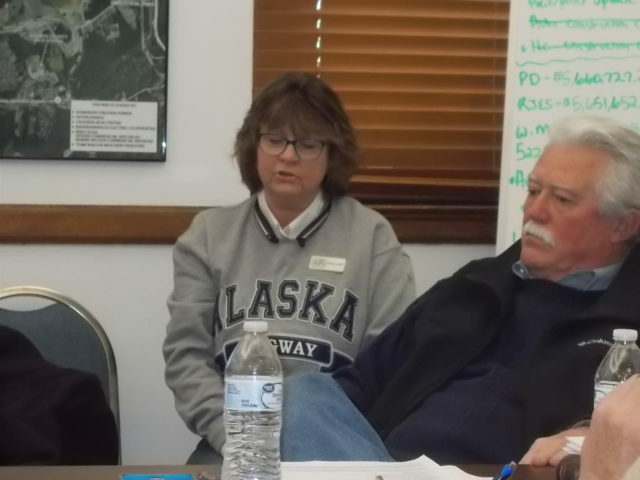 At the January 30 regular board meeting, Main Street Market owner Ginny Lesser was present to explain her perspective on normal maintenance costs she is responsible for versus major structural repairs to the building she hopes the EDA will foot the bill for. As EDA Secretary Missy Henry reported on January 23, Lesser is willing to pay for heating and air-conditioning (HVAC) maintenance in an attempt to reduce what has been an average $1500-plus monthly utility bill over the past two billing cycles, if the EDA will cover a minimally-estimated $51,000 roof repair expense. The HVAC repair has been estimated at around $14,000. The $51,000 roof repair is for a shingled roof, compared to a $144,000 estimate for a metal roof replacement, EDA staff explained. Board member Ed Daley suggested that with potential contractor inspections and bids anticipated in that price range on the roof work in coming weeks that the EDA should have a structural engineer involved to represent its interests in getting the best deal possible. Interim Executive Director John Anzivino agreed, observing that the EDA should have a substantial overview of what it is taking on in costs and maintenance responsibilities for the building – “It is an EDA-owned building, we have a responsibility to fix it,” he told the board. 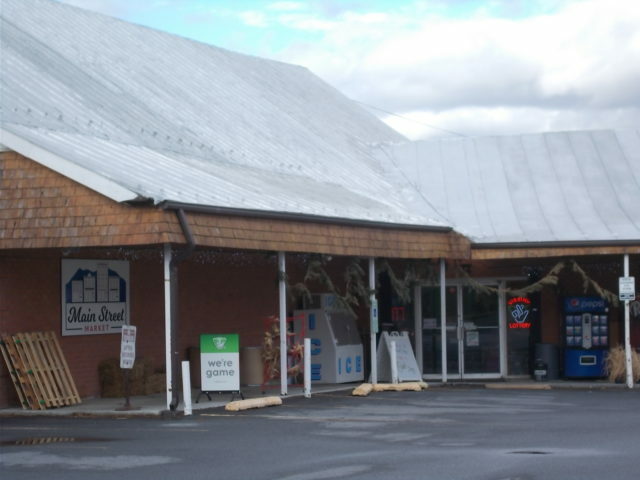 A roof in need of repair – the EDA-owned former Stokes Mart building now housing the Main Street Market catering to downtown Front Royal shopping needs. Lesser told the EDA Board of Directors the office portion of the building has been closed off but the heating-related utility bills remain what she called “shockingly high”. Board member Ron Llewellyn, who took the point on January 23 in wondering if the EDA should consider a sale of what he observed has become a money pit for the authority, pointed at a lack of insulation in the building that once housed Stokes Mart. “There is no insulation in the building – I worked there about 40 years ago when I was in high school,” Llewellyn told his colleagues of what is apparently not a new issue of structural maintenance. EDA Attorney Dan Whitten pointed out that like the previous tenant, B&G Goods that went out of business within two years, Lesser has a lease with an option to buy on the property. Asked what the purchase price of her option to buy was, Lesser replied the remaining principal on the EDA’s purchase loan. Whitten verified that lease-to-buy price in Lesser’s contract. The Main Street Market owner also said it was her understanding that her monthly rental covered the EDA’s mortgage payment. 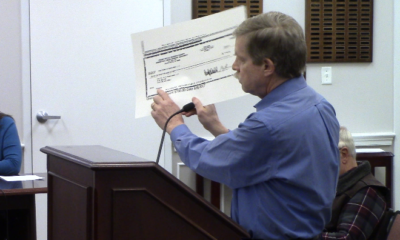 EDA Secretary Henry pointed to a recent rise in that payment, noting Lesser’s rental payment still came close but no longer entirely covered the EDA’s mortgage payment. Llewellyn has cited a $440,000 number in questioning what he has termed a “too-high” EDA investment in the property at the intersection of East Main and Water Streets in downtown Front Royal, with an additional $50,000 or more expense looming. He has questioned the authority’s ability to recoup its investment through a sale. The 2014 Deed of Transfer to the EDA/IDA (Industrial Development Authority) cites a purchase price of $398,218.85 and an assessment of $477,000. Whitten said the deed of purchase indicates the $398,000-and-change price covers both the Stokes Mart building and the residential rental building at the corner of East Main and Water Streets. “I’m concerned where we’re going to end up – we should be cautious,” Daley told his colleagues of coming expenses to maintain the property as either a viable source of rental income or an attractive purchase option. “We should explore interest in a sale,” Llewellyn reiterated of the point he made a week earlier. 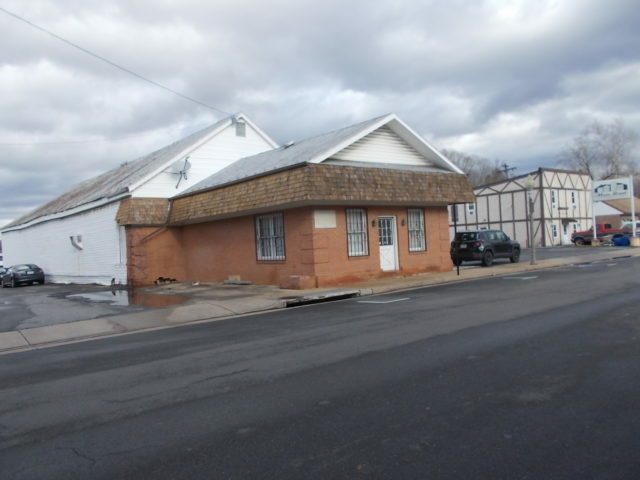 And on the topic of sales, Llewellyn told the board he had explored the EDA purchase of the building and discovered that despite the in-town location the town government had not been a catalyst in pushing the EDA toward that purchase. 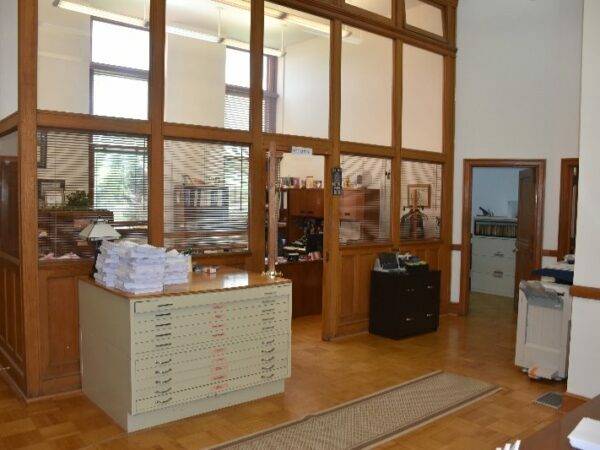 “That is correct,” Town Manager Joe Waltz said of his exploration of the Town role, if any, at the time the building was purchased from former county supervisor Bernie Stokes’ trust in 2014. Stokes owned and operated the downtown business for decades before his retirement due to age and failing health. Interim Executive Director John Anzivino was given direction to explore coming maintenance bids and oversee that the EDA interest in repairs at a reasonable price is maintained in conjunction with Lesser’s interest in her business on the site. 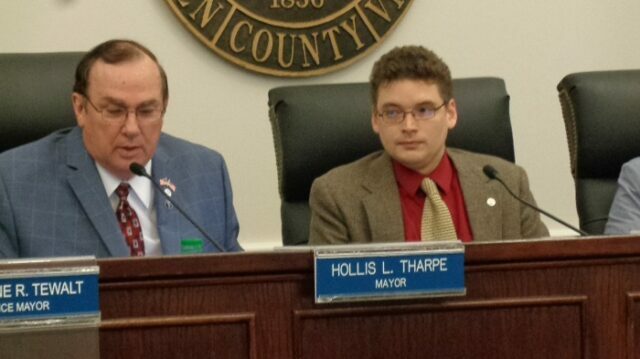 “I think we’ve given John enough on this,” board Chairman Blanton observed. That discussion segued into Anzivino’s report on recent conversations regarding setting up electrical service at the EDA office complex through solar panels installed in the roof of the of the old American Viscose Admin building. “I met with Green Technologies yesterday,” Anzivino reported. He explained that software was still being installed to allow the power to be shifted to the building’s internal systems to facilitate individual EDA and tenant controls of their electricity through the solar panel system. Contacted about the potential of a solar power aspect to repairs at the Main Street Market while roof and HVAC repairs are being explored, EDA Attorney Whitten said there was no plan to install solar panels in the old Stokes Mart building as a potential alternative energy source. In addition to the general store building, the property contains an apartment building to the far right behind the Main Street Market sign. 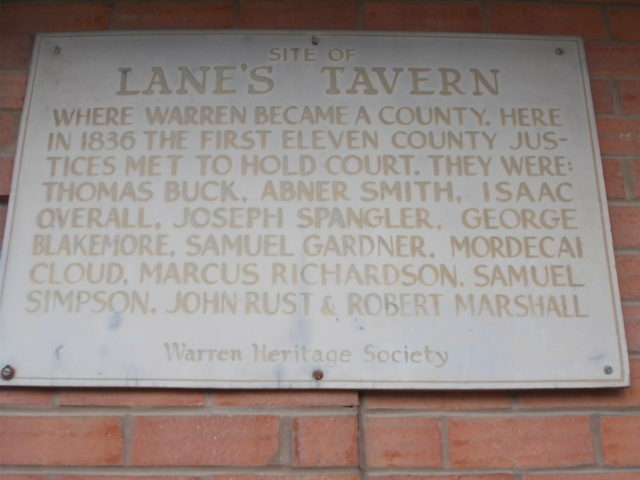 Then there is the history of the site – Lane’s Tavern, where the county’s first justices met to hold court circa 1836. Audit report still unfinished but is its shadow being cast over suggested changes to EDA processes? 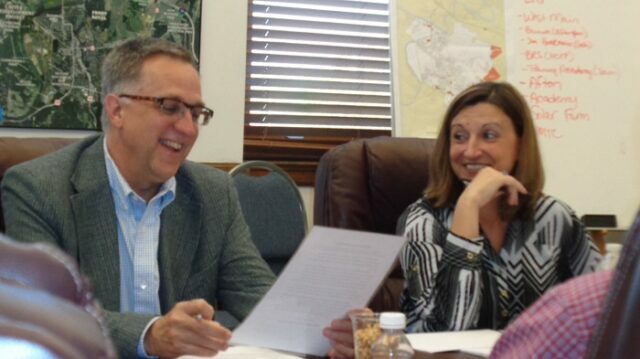 On Monday morning, April 15, at the first of two special meetings of the Front Royal-Warren County Economic Development Authority Board of Directors called this week secretary and assistant secretary appointments were made. A three-member quorum – only five of the seven board seats are currently occupied – voted to appoint Ed Daley, in his absence, as secretary; and Vice-Chairman Bruce Drummond took on the duty of assistant secretary. 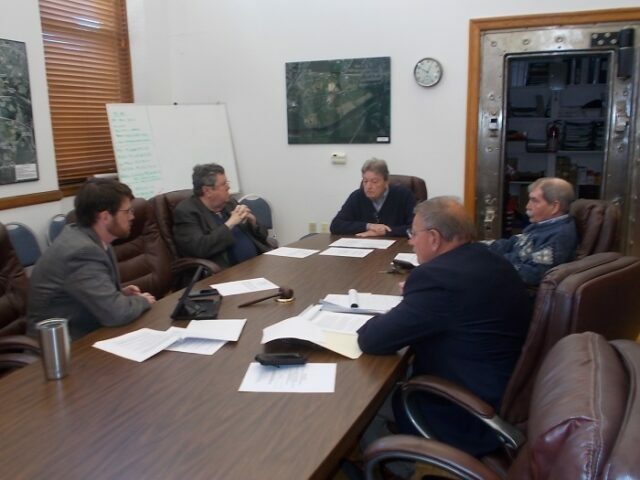 Present were Chairman Gray Blanton, Drummond and Treasurer Tom Patteson, along with Interim Executive Director John Anzivino and Attorney Dan Whitten. 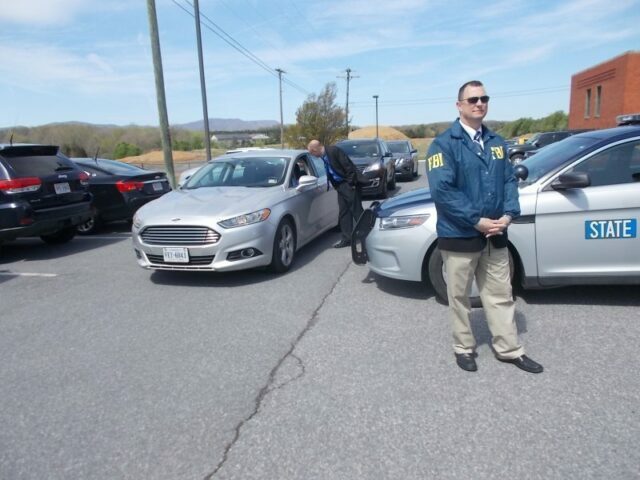 As literally everyone in Warren County not in a coma now knows, the FBI and State Police swooped in Tuesday to search the EDA headquarters and remove some items related to criminal investigations stemming from the EDA forensic audit and consequent civil litigation seeking the return of over $17 million in allegedly embezzled or misappropriated EDA assets. A coordinated – well, as coordinated as possible – April 17 press perusal of the front portion of the EDA office during Wednesday’s closed session indicated that the computer hard drive and a cell phone previously seen in former Executive Director Jennifer McDonald’s still-locked down office were no longer on her desk. EDA officials would not confirm whether any of the office printers had been removed by law enforcement the previous day. 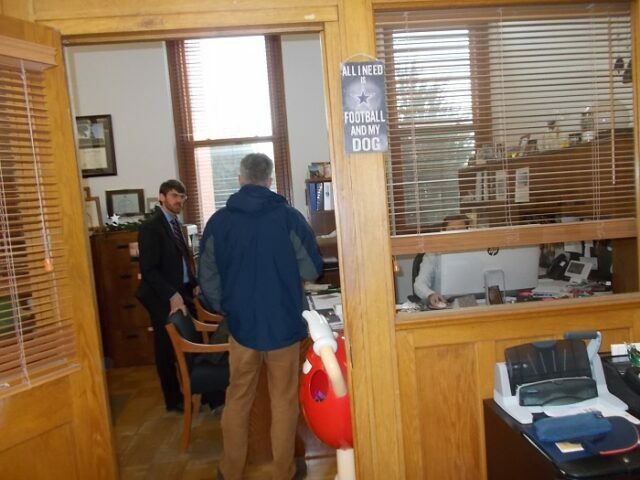 Above, EDA Attorney Dan Whitten and Board member Greg Drescher oversee a school staff tech person locking down outside access to the executive director’s computer upon announcement of her resignation on Dec. 20, 2018. Below, a somewhat emptier desk in the still locked-down office the day after FBI-VSP search of EDA headquarters. Wednesday’s special meeting closed session was called to discuss candidates in the running to succeed Interim Executive Director John Anzivino on a permanent basis, or at least as permanent as such things may be. Returning to open session the board quorum of four – up by one from Monday with the addition of Mark Baker – resolved to continue the process of selecting its new executive director. During a brief discussion with media following adjournment Anzivino declined to speculate on when an appointment might be announced. Previous EDA board discussion indicated a desire to have a permanent director in place in May. Anzivino indicated the field had been narrowed to three from which to choose. While declining to give any detail on the previous day’s search by federal and state law enforcement, Anzivino reiterated that the EDA will continue to cooperate in the criminal investigation related to information uncovered by the forensic audit of EDA finances underway since mid-September 2018. 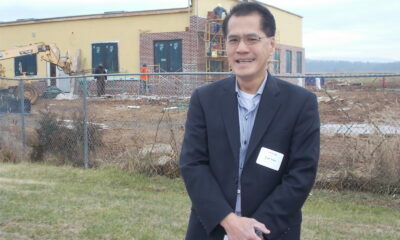 Anzivino also said that from personal observation work appears to be continuing on the building on the ITFederal site. ITFederal and its principal Truc “Curt” Tran are among the nine defendants named in the EDA civil litigation seeking recovery of allegedly misappropriated EDA assets. While stating he no longer plans to relocate ITFederal to the 30-acre parcel at the Royal Phoenix Business Park sold to him for one dollar, he has indicated a plan to rent space in the building under construction out. A road to where? 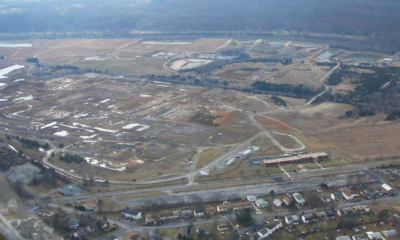 – Phase One of the West Main St. connector was authorized with a three-building ITFederal complex generating 600 high-paying tech jobs promised by Congressman Bob Goodlatte on 30 acres gifted by the EDA for one dollar to get the re-development ball rolling at the former Superfund site. Recent FIOA information indicates Goodlatte asked for the $10-million EDA loan to Tran and ITFederal. During the open portion of Monday’s special meeting Board Chairman Gray Blanton broached the idea of getting an accounting of current business the EDA is engaged in as a positive counterpoint to the heavily-publicized scandal revolving around the alleged embezzlement of EDA assets discovered by a lengthy, six months and counting and $760,000 and climbing forensic audit of EDA finances. Anzivino said he would prepare a press release summarizing property maintenance, project development, and tenant recruitment, including the U.S. Census Bureau for a training center. 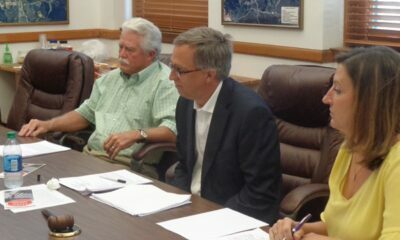 Also on Monday Vice-Chairman Drummond asked if the town government was going to get its formally requested copy of the forensic audit that has thus far resulted in the filing of civil litigation seeking recovery of that minimum $17.6 million in EDA assets said to have been moved for personal benefit during Jennifer McDonald’s directorship and oversight of EDA finances. 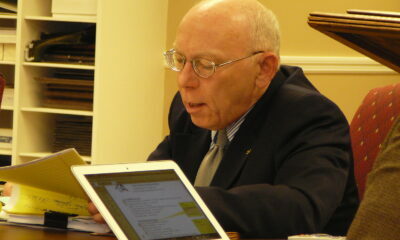 Chairman Blanton responded that he saw no reason the Town shouldn’t get a copy. 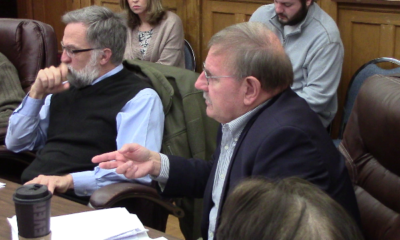 However, EDA Attorney Dan Whitten cited a semantical issue with the Town request, which had initially been stated as for the “final report” which Whitten pointed out does not yet exist. The forensic audit continues to develop, so no “final” version is available. As previously reported, it has been noted that thus far only the EDA Board of Directors has seen the written updates of the forensic audit and Anzivino confirmed that once those drafts of the Mueller Report, I mean the Cherry Bekaert Report have been reviewed by the EDA board they have been shredded. 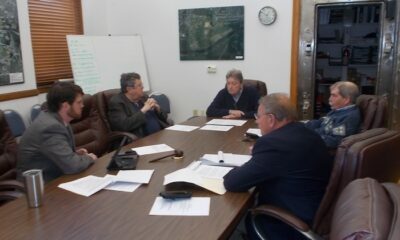 Following Wednesday special meeting Anzivino said he thought his Tuesday meeting with Town Attorney Doug Napier and Town Finance Director B. J. Wilson went well, and that the semantical issues would be worked through to try and accommodate the Town’s request to be kept abreast of the information thus far available from the forensic audit. 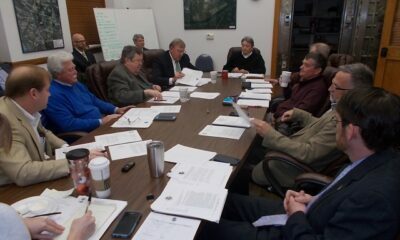 Following adjournment of the approximately 15-minute Monday meeting, the board broke before reassembling at 11 a.m. for a joint signing of the approximately $11 million bond issue on three capital improvement projects. 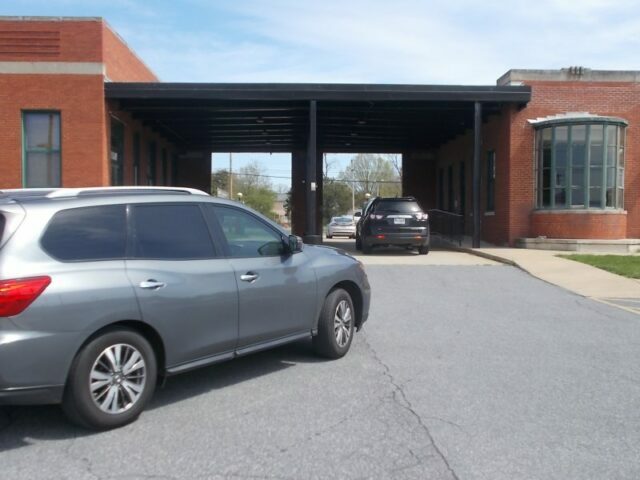 Those projects are renovations at Ressie Jeffries Elementary School and on county and school space at the Health and Human Services complex in the old middle school building on 15th Street; and construction of the new Rivermont Fire Station. 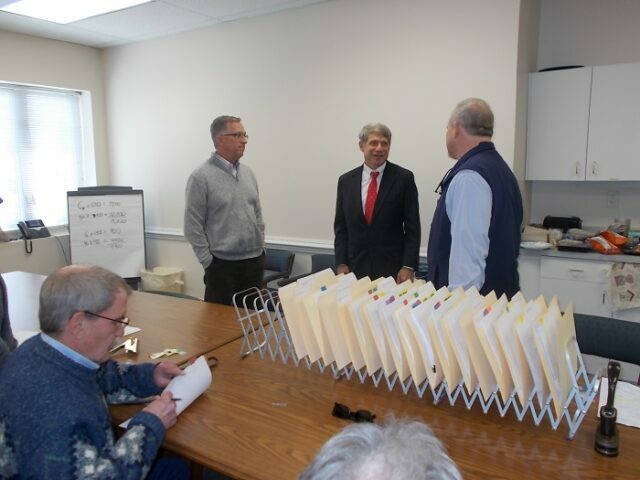 County Board Chairman Dan Murray joined Blanton and Drummond in signing the documents, with county and school administration staff present, as well as Sands-Anderson bond counsel Dan Siegel. 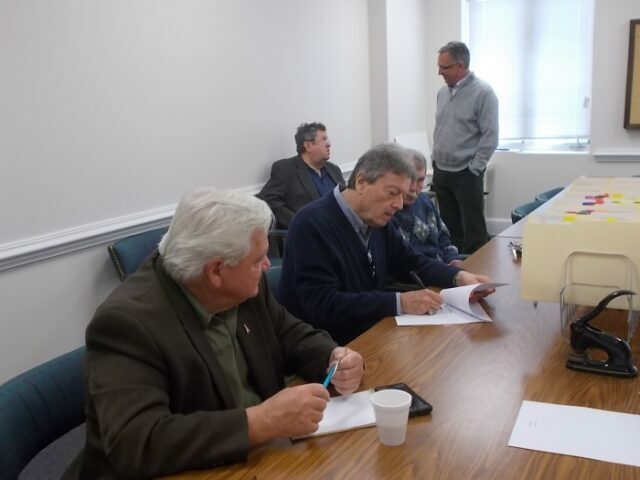 From left above, Dan Murray for the County and Gray Blanton and Bruce Drummond for the EDA sign off on bond issue for three capital improvement projects as Tom Patteson and Greg Drescher chat in background. Below from left, Drescher, bond counsel Dan Siegel and Doug Stanley chat as Bruce Drummond seated, peruses the paperwork. In this second segment of the initial interview on June 15, 2017 with Front Royal Police Department Investigators Landin Waller and Crystal Cline, McDonald pushes forward a theory targeting this reporter as a player in the EDA office break-in revolving around inquiries into and source information acquired that ITFederal principal Truc “Curt” Tran was the “secret investor” in the planned Skyline Regional Justice Academy. McDonald referenced a time I worked at local radio station WFTR (WZRV The RIver 95.3 FM) and claims I accessed public files. However I never actually was in the EDA offices suite while a radio station employee. After being fired from the radio station, perhaps coincidentally at the very time I was seeking information from Congressman Robert Goodlatte and his staff about the congressman’s involvement with and knowledge of ITFederal and its owner, McDonald invited me to come to her office “to talk”, presumably to glean information about what I had learned about Tran and his company. On 05/18/17 I, Detective Landin J. Waller, was contacted by Captain Ryman in reference to an incident at the .Warren County Economic Development Authority (EDA) located at 400 Kendrick Lane. Myself and Detective King responded to the scene where we were met by Captain Ryman and Captain Nicewarner. Detective King and I were briefed about the scene by Captain Ryman. 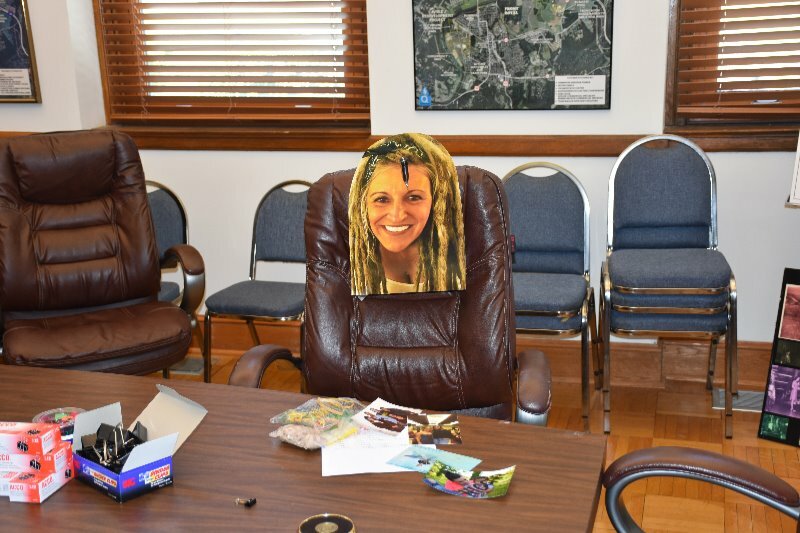 We were advised four (4) 4″ by 6″ personal photographs and a large cut out photograph of Jennifer McDonald were taken from McDonald’ s office and found in the conference room. Three ( 3) of ‘the 4″ by 6″ photographs had McDonald in the picture with her face scratched out with a sharp object. The fourth 4″ by 6″ photograph was a picture of McDonald1 s niece and her toddler aged son with the word “NIGGAR” written in black marker across the face of the child. 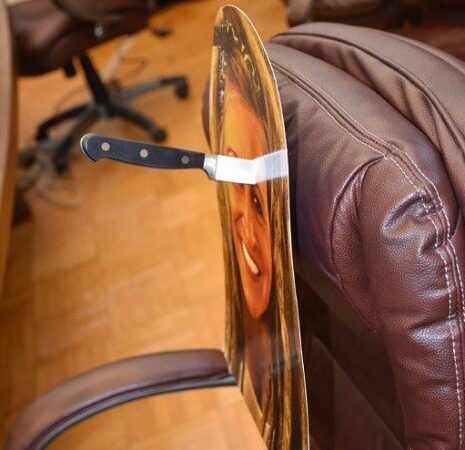 The large cut out photograph had a black plastic handle steak knife plunged through the forehead of the photo and it was stuck to the head rest of a brown leather office chair where McDonald admittedly normally sits. Detective Waller noted that there was undisturbed dust on the window ledges and on the blinds at every window. The window to McDonald’s office was raised up about two inches and not secured; However there was cobwebs and undisturbed dust on the blinds and window ledge. There were no signs of forced entry to the buildings windows, and doors. As I noted there was undisturbed dust on the window ledges and on the blinds at every window. 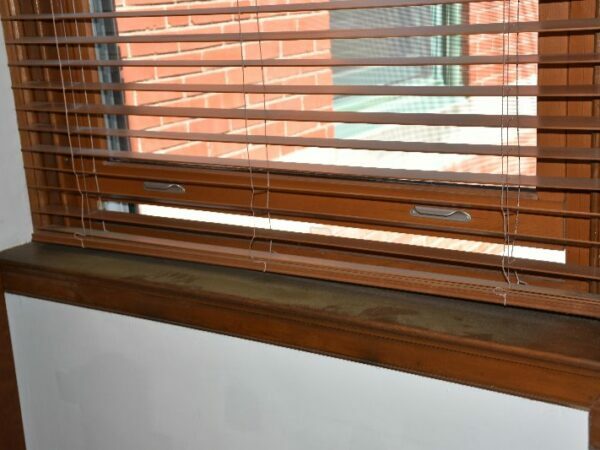 The window to McDonald’s office was raised up about two inches and not secured; However there was cobwebs and undisturbed dust on the blinds and window ledge. The two doors of access to the building and office did not have pry marks or signs of tampering. 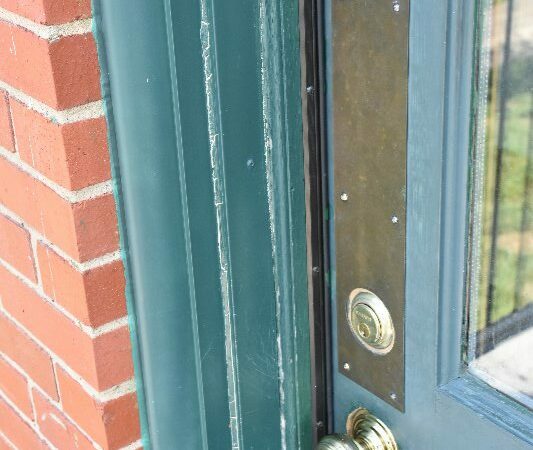 Investigators responding to the reported break-in documented that the two doors of access to the building and office did not have pry marks or signs of tampering. The scene was photographed and processed by Detective King. Detective King took overall, midrange, close-up, and close-up with scale photographs. All photographs will be attached to this report in the images file. There were 6 items of evidence collected and packaged from this scene. Item #1: (4″ by 6″ photograph of niece and son), Item #2: 4″ by 6″ photograph of McDonald with Dolphin), Item #3: (4″ by 6″ photograph of McDonald with Niece), Item #4: (4″ by 6″ photograph of McDonald and family) , Item #5: (cutout picture of McDonald) , Item #6: (black plastic handle steak knife) . Detective King dusted the conference ‘ table and drawer for latent prints but was not successful. I interviewed the two employees that were at the office, Jennifer McDonald and Missy Henry. These interviews were audio recorded and will be added to the case file. 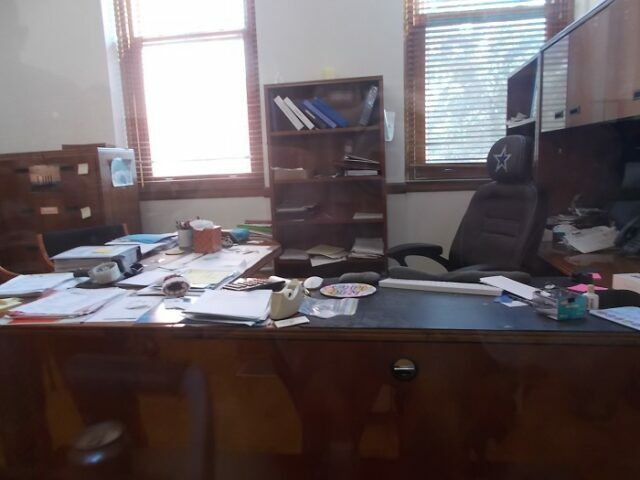 From the interview with McDonald, I was informed that she was the Director of the EDA inhere she has been employed since 1999, She advised there are two other employees, Missy Henry and Maria Jones, that work out of this office. McDonald advised me she left the office last evening (05/17/18) at 17:00 or 17:30. She said she went to a Rotary meeting at 19;30. McDonald said left from the Rotary meeting and went directly home and the next morning she arrived to work at about 07:30. 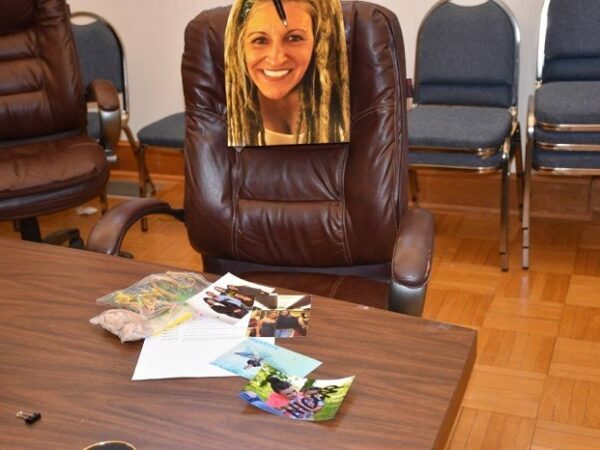 McDonald said she went to her office and she and Missy were talking when she noticed some pictures were missing from her office but she was not sure which ones. 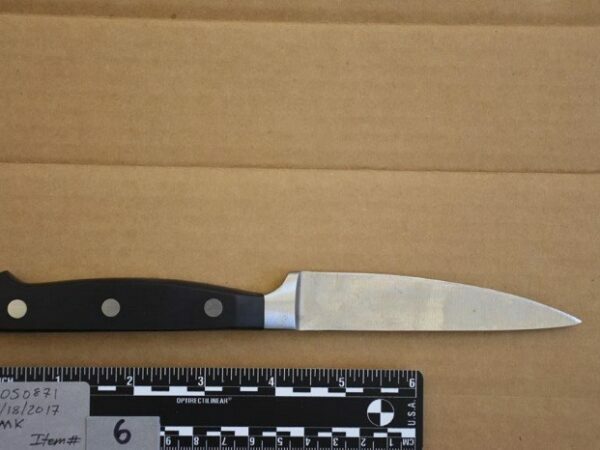 She said a while later she was notified by Missy of the scene in the conference room – McDonald did say that last Thursday morning she noticed a large knife (from the kitchen area of the EDA) was in her chair in the conference room on 05/11/17, but did not notify the police but thought it was odd. Jennifer told Investigator Waller that this knife was found lying in her chair in the conference room on 05/11/17, but she did not notify the police. I asked McDonald if she could think of anyone that might be mad enough to do something like this, she said “yes”. She informed me that there is a group of people who have made derogatory statements about the Work-Force Housing Project in the Royal Examiner. McDonald went on to explain there was a piece of land that was to be gifted to the town for this project; However, the EDA missed the deadline for the land to be gifted and now the land must be purchased. She said the piece of land in question was gifted by her family members (Aunt & Uncle). She stated the Royal Examiner has posted articles about this land deal in which many persons have commented negatively about her and the EDA. 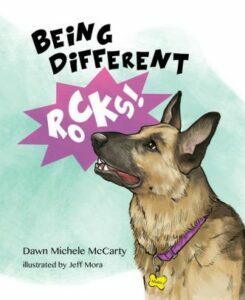 She listed Councilwoman Bebhinn Egger, Mike Graham, Stan Brooks, Shea Parker, Tom Conkey, Roger Bianchini, and Norma Jean Shaw as persons who she felt were angry with her. 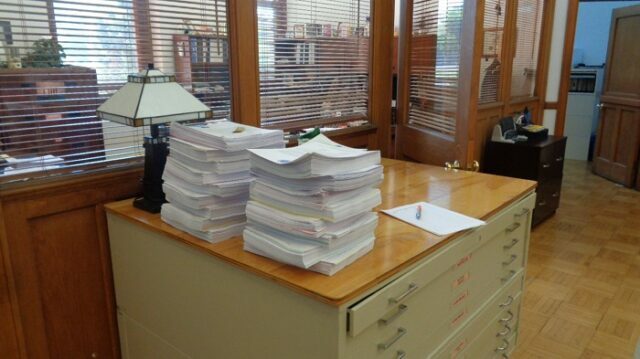 Stack on the cabinet were copies of a voluminous press release and documents related to questions posed by then-Town Council member Bébhinn Egger. Those questions had been promised to Egger May 19, 2017, one day after the break-in was reported. McDonald informed me that herself, Missy, and Maria Jones are the only ones with keys to the outside of the building and to the office door. She did say there was a spare key for each door in a real estate type lock box that was located on the iron railing of the stoop. 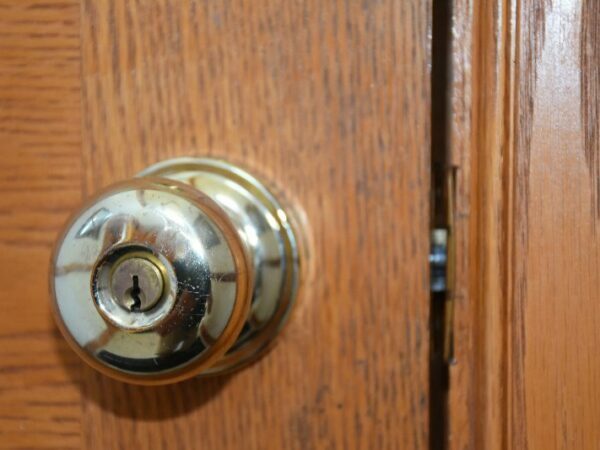 She advised that Maria Crigler, The Administrative Assistant of Northern Shenandoah Valley Regional Commission, (the neighboring business) also has the code to the lock box because they have a spare key in the lock box. McDonald informed me the keys are kept in the lock box incase someone forgets their key to the office and needs to gain entry to the office. I was then informed that all 9 employees at Northern Shenandoah Valley Regional Commission have the code to the lock box. I also interviewed Missy Henry in the conference room. Henry stated she has been employed at the EDA as an Administrative Assistant since 2012. She advised that she left the office on 05/17/17 at 17:05 and did not return to the office around 0800 on 05/18/17. Henry advised me she was the first to notice the conference room scene. Henry also advised me that she had just changed the code to the lock box this past Monday to a 3 digit code instead of a 4 digit code. She advised that no one has been notified of the change except herself, Jennifer and Maria. I spoke to all the employees at Northern Shenandoah Valley Regional Commission and determined that the last employee to go leave the building was Brandon Davis. X was advised that Davis1 wife went into labor last night and he stopped by the office to grab some items from his desk before going to the hospital. I have yet to speak with him, but all the other employees did not notice anything out of the ordinary on 05/17/17. Later on that day, I spoke with employee Marla Taylor Jones by phone. Marla advised she is the current Director of Marketing with the EDA and has been since 2009. She said she arrived to work at 08:10 on 05/17/17 and left at 17:00. She did say she noticed a man who was inside the gate of the property and he was holding a phone or a video recorder and it appeared he was recording. She described the male as a white male with a beard wearing blue plaid shirt, shorts, and a ball cap. ‘ She said he went outside to ask him if he needed assistance but he walked through the breezeway and towards Ameri-Sist which is a business on the east end of the building. Jones said she had Henry call Ameri-Sist to see if the man came to their business, but was informed that no one had stopped in. Jones also said that when she was leaving at 17:00 she noticed an old red Ford Explorer or Blazer with a white male inside and the engine was running. She said he was on the road behind the building and she asked him if he needed help. She said he told her he had just made a delivery and was routing his next delivery. She said she thought this was a bit unusual. On 05/18/17 after clearing the initial asked McDonald if I might have the spare I wanted to set up surveillance cameras, keys. On 05/18/17 at 17:30 hours Myself, Sergeant Cline set up surveillance video scene, I responded back to* the EDA and keys to the building and office because McDonald agreed and gave me the spare Detective King, Detective Fogle and inside the office. 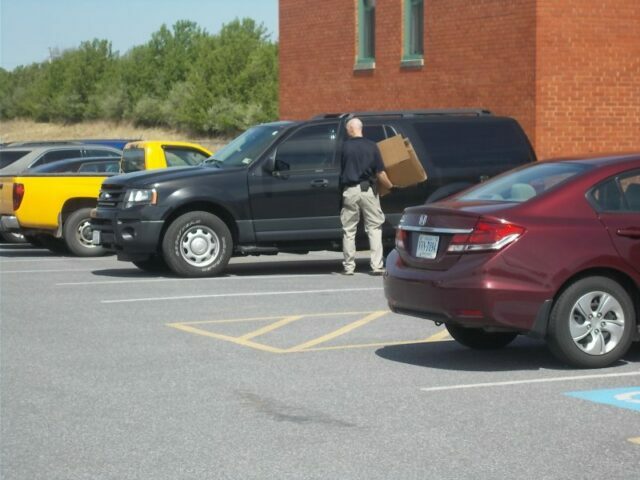 Agents from the Federal Bureau of Investigation and Virginia State Police conducted a search and apparent removal of items from the office of the Front Royal-Warren County Economic Development Authority on Tuesday morning, April 16. FBI Special Agent/Supervisor Neil Mathison told press present at 11:30 a.m. that units had been on the scene since early morning and expected to be done with their search of the premises by mid-afternoon. Other than that summary of the federal and state law enforcement presence at the scene, information on the nature of the search and its enabling authority was not forthcoming. 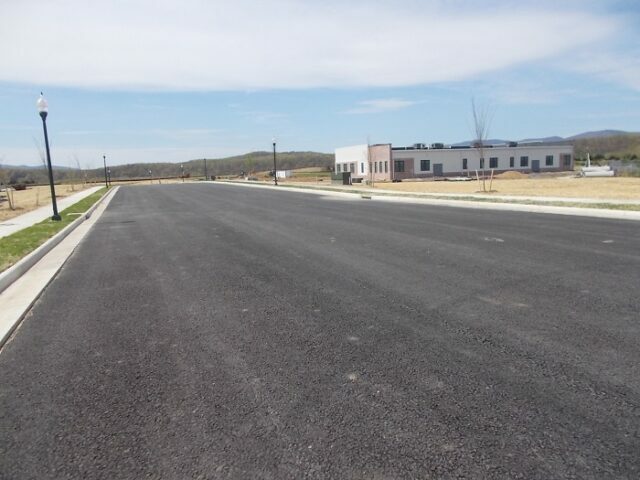 Boxes were seen being carried in and out of the rear parking lot, main entrance to the western section of the old American Viscose Administration Building the EDA shares with the Northern Shenandoah Valley Regional Commission. 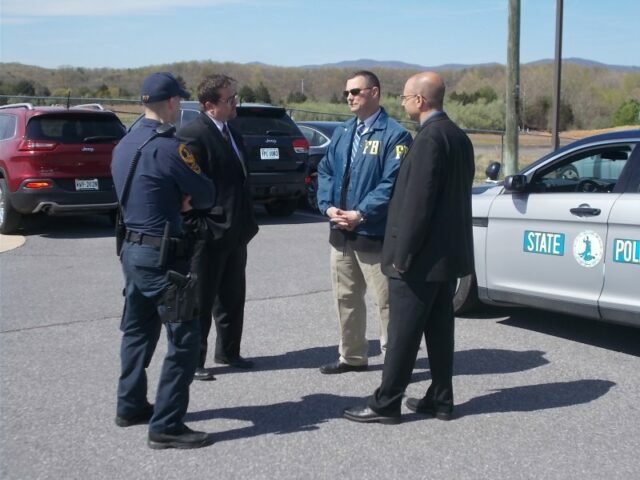 Present in addition to FBI Supervisor Mathison, VSP Special Agent in Charge Lt. John Defilippi and additional personnel from the federal and state law enforcement agencies, was Warren County Assistant Commonwealth’s Attorney Bryan Layton. Layton confirmed that his boss, Brian Madden, was off on Tuesday. The Commonwealth’s Attorney’s Office said that Madden was not expected back in the office until next week. A Special Grand Jury requested by Madden and authorized by Circuit Court Judge Clifford L. Athey Jr. to explore potential criminal charges related to allegations of financial misappropriations of EDA assets in recent years was empanelled on Thursday, April 11. While tight-lipped like the law enforcement officials present, Layton did say that the EDA Special Grand Jury would determine its own schedule as the members saw fit to accomplish their assigned task. However asked whether the search in progress had been authorized by the Warren County Special Grand Jury Layton, like the federal and state law enforcement official present, was non-committal. A Richmond FBI Public Information Officer referenced by Mathison for additional information, said that at this time no further information would be released by the FBI. 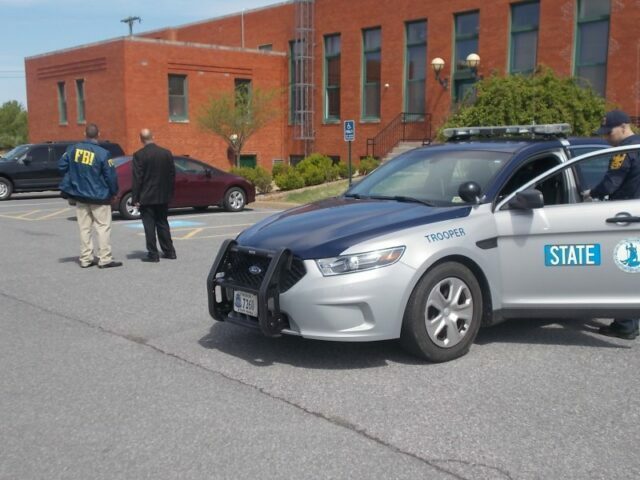 The VSP public information office deferred to the FBI as the lead agency in the investigation. 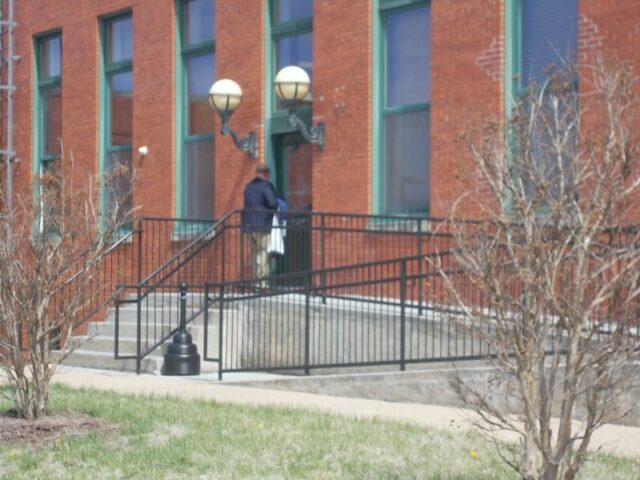 Interim EDA Executive Director John Anzivino was seen arriving and entering the EDA office while media was present. In response to a question, Anzivino said he had been able to meet with Front Royal town officials Tuesday morning as planned to discuss a Freedom of Information Act request the Town has filed regarding the results of the six-month-old, $760,000 forensic audit of EDA finances currently underway. Interim EDA Executive Director John Anzivino returns to office shortly after 11:30 a.m. as law enforcement search continued. 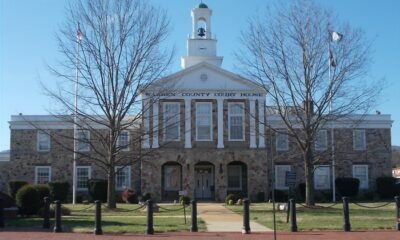 It is the civil litigation filed on behalf of the EDA on March 26, by the Sands-Anderson law firm seeking recovery of a minimum of $17.6 million in allegedly misdirected EDA assets that was the basis for the launching of the Warren County Special Grand Jury. Mathison, Defilippi and Layton did not respond to questions about whether Tuesday’s law enforcement activity at the EDA headquarters was a result of the special grand jury investigation or another potential investigative source at the state or federal level. And three law enforcement vehicles prepare to roll out. 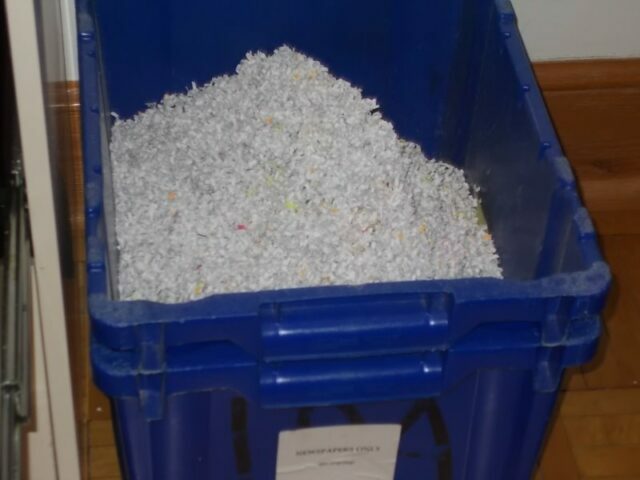 Recent file photo of shredded documents in EDA office recycling bin – according to Interim Executive Director Anzivino various updated forensic audit reports have been shredded after review by the EDA Board of Directors. Anzivino explained that the EDA is the only board that has thus far viewed the evolving Cherry Bekaert documentation of its forensic audit investigation. 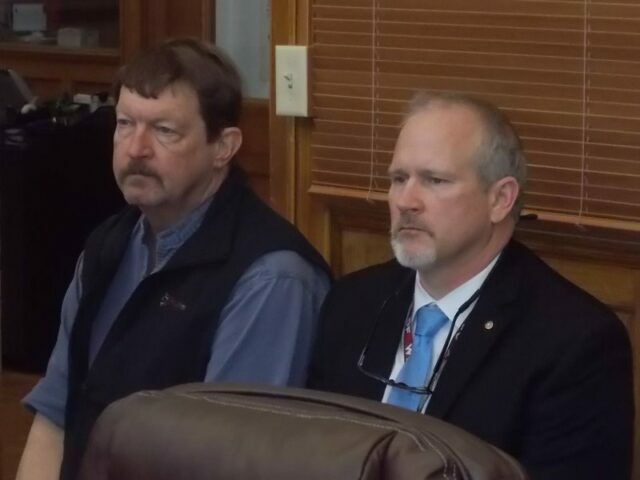 However, former County Board Chairman Tony Carter and County Administrator Doug Stanley, below at March 22 EDA meeting, have been allowed to sit in on EDA board discussion of the report. 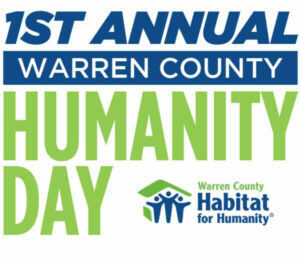 FRONT ROYAL – Nearly two years ago, on May 11, 2017, former Front Royal-Warren County EDA executive director Jennifer R. McDonald claims she found a knife lying in the chair where she normally sat. There was no signed of forced entry, nor was a call made to police. A week later, on May 18, 2017, McDonald did telephone the Front Royal Police Department, who found photos of McDonald with the face scratched out on a boardroom table, and another photo with a knife stuck through the forehead, as well as some defaced family photos. Police say nothing was reported missing, there was no sign of forced entry and to this day, the case remains unsolved. Royal Examiner, beginning today, will publish the entire investigative file of the Front Royal Police Department, which was obtained by FOIA request. Over the next days and weeks readers will be able to follow the evidence themselves and see that Waller, Cline, and Investigator Zach King did a thorough and complete investigation. 05/11/17 McDonald said a knife from the kitchen area was found in her chair in her office. No forced entry. Not reported to Law Enforcement. 05/18/17 McDonald reported incident at EDA. Photos of McDonald with her face scratched out found on boardroom table and cut out photo with knife through forehead. No forced entry: Nothing reported stolen. 05/21/17 McDonald said she talked to Ron Llewellyn by phone about meeting on the B&E. Llewellyn told McDonald John Costello knew about the B&E and "missing files". 05/22/17 McDonald called to tell me about phone call with Llewellyn and noted there were no files missing. 05/24/17 McDonald notices 3 confidential files (ITFederal, Workforce Housing, Criminal Justice Academy) missing from her cabinet above her desk. Sends e-mail to ljwaller@frontroyalva.com about missing files. Incorrect e-­mail address. Sometime between 05/30/17 to 06/01/17 Sammy North approaches Roger Bianchini at Melting Pot and curses at him for his Royal Examiner article on Jennifer McDonald. Bianchini makes FRPD Captain Jason Ryman aware of incident but does not wish to pursue charges. 06/05/17 McDonald has meetings with Royal Examiner reporters Norma Jean Shaw and Roger Bianchini at the EDA office. (separate times) Gives both reporters detail of the criminal investigation at the EDA and shows pictures of the crime scene from her phone. 06/07/17 McDonald and EDA Board of Directors hire Private Investigator Ken Pullen. 06/08/17 Detective Waller and King respond to EDA to collect DNA from McDonald. McDonald notified FRPD about hiring Private Investigator. 06/14/17 McDonald sends Detective Waller text about e-mail she received from Norma Jean Shaw indicating she has confidential information about Curt Tran being investor for the Criminal Justice Academy. 06/15/17 Waller and Cline interview McDonald at CID Office. McDonald requests that we speak to Norma Jean Shaw and ask her about pictures. McDonald states Shaw has not seen scene photographs. Interview ends 14:30. 06/15/17 Waller and Cline interview Norma Jean Shaw at CID Office. Shaw states McDonald showed her EDA scene photos from her personal phone. Shaw states that Donnie Poe came into Mike McCool's office and was upset with Jennifer McDonald over a land (Farm) she recently purchased in Browntown or Limeton. Poe wanted to buy the land and he feels McDonald bought it out from underneath him. Shaw disclosed her source for the Academy investor came from a client of Brett Hrbek. 06/16/17 Waller and Cline interview Roger Bianchini at CID Office. Bianchini states that he met with McDonald 06/05/17 and was provided details of the B&E at the EDA and shown pictures. 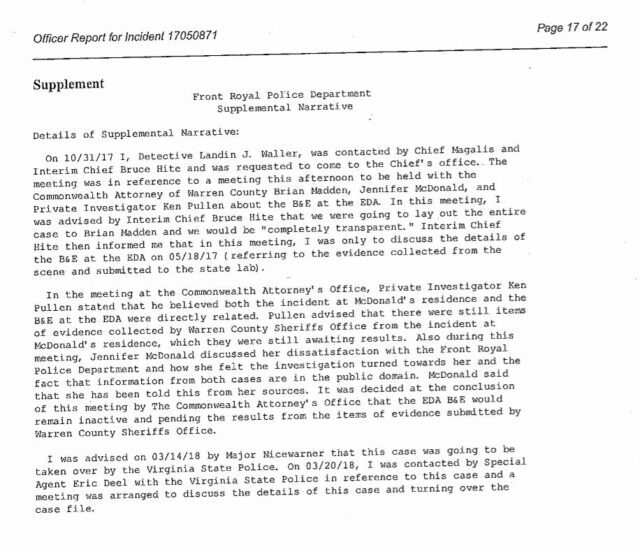 Bianchini stated he had meeting with McDonald on 06/15/17 between 15:00-16:00 at her Office in the EDA building & said McDonald gave him details of an incident at her residence involving a paving stone thrown through her front door window and a typed note being found on the ground with two phone numbers. Bianchini said one of the numbers belonged to Tom Sayre and the other was a 202-area code. 06/16/17 After Waller and Cline interview Bianchini, Lieutenant Gordon Foster with WCSO contacts Detective Waller to inform him of new incident at McDonald's residence. Foster stated Deputies responded to McDonald's residence on 06/15/17 at 21:03 and described the same incident Bianchini had just detailed in his interview. 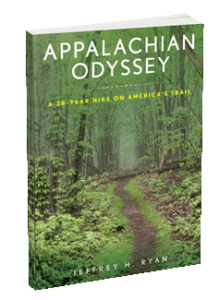 06/16/17 Waller and Cline interview Marla Jones at the EDA. Confirm that Bianchini was in McDonald's office on 06/15/17 between 15:00 and 16:00. 06/16/17 Waller and Cline re-interview Bianchini about details of incident McDonald disclosed to him at her residence. Bianchini confirms all details of incident including the note. On June 15, 2017, Front Royal Police Investigator Landin Waller and Investigator Crystal Cline interviewed McDonald. She has a great deal to say about who she thinks may have been responsible for the alleged break-in, including former town officials, a local business man, an EDA board member—even a local reporter whom she knew was investigating her real estate purchases with a local elected official. In the next video segment, McDonald makes several untrue statements about this reporter, perhaps in an attempt to impugn character and to deflect any suspicion from her own actions? Royal Examiner readers will have to examine the evidence and decide for themselves. From last week’s story we quoted from an April 2017 Royal Examiner story (See Related Story): “Asked about the decision to purchase following the meeting, McDonald said the EDA had already spent a half-million dollars in preparatory work, including site planning, engineering, town and state DEQ permitting fees, so the board decision was that it would be best to proceed with the transaction as a purchase, rather than abandon the project and site at this point. 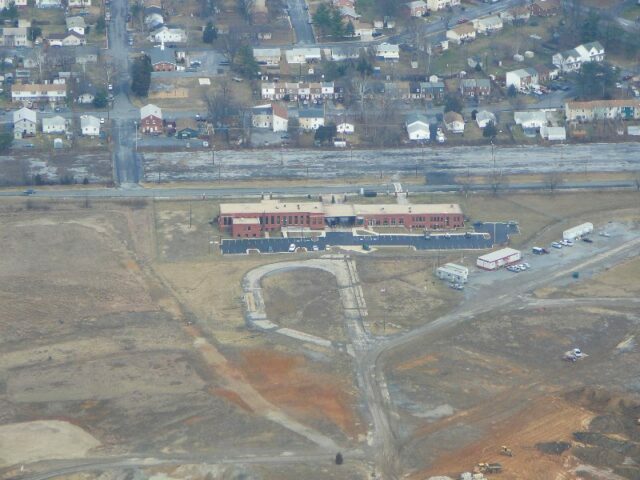 The following month, on May 19, 2017, coincidentally one day after an alleged break-in of the EDA office in which no signs of forced entry were apparent, the EDA released a 383-page explanation of the workforce housing project following then-Councilwoman Bébhinn Egger’s submission of six specific questions concerning the project. And finally, appraisal prices on the Afton Inn and old Stokes Mart/B&G Goods building the EDA is also involved in managing or marketing. 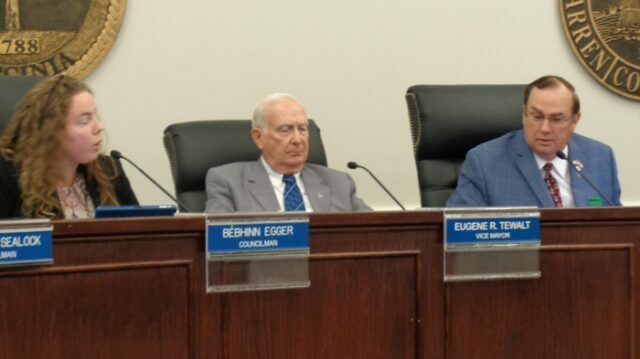 Bébhinn Egger, above left, and John Connolly, below right, had some testy exchanges about the viability of raising questions about how the EDA was functioning and representing those functions in 2017. Three of her then-colleagues, including Eugene Tewalt and Hollis Tharpe also pictured (as well as Jacob Meza) apologized to Egger on March 25, 2019, for their stances at the time. First impression of EDA reply: 383 pages later what have we learned? 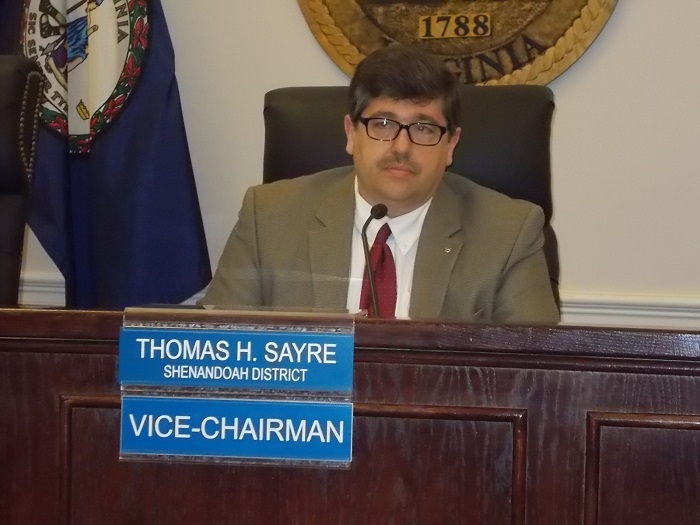 At the April 2, 2019, Warren County Board of Supervisors meeting Shenandoah Supervisor Tom Sayre, who is engaged in dueling defamation lawsuits with Jennifer McDonald, broached the topic of potential conflicts of interest impacting the initial town police criminal investigation of the May 18, 2017 alleged EDA office break-in and the county sheriff’s office exploration of alleged incidents at McDonald’s home in June of that year. Sayre cited McDonald’s complaints that the FRPD investigation of the EDA office break-in–a break in with no signs of forced entry–were turning toward her as a suspect. He also questioned what he said was a resultant decision by the commonwealth’s attorney’s office to keep the investigation on inactive status, where it had been put at the request of then EDA Chairman Greg Drescher in favor of an investigation by Private Investigator Ken Pullen. Pullen was initially contracted by the EDA regarding the office break in, but his work was soon handed over to a private contract with McDonald related to the alleged ongoing incidents at her home. What do the Sayre-McDonald lawsuit and the Titanic have in common? Sayre also pointed to the personal relationship between then-acting FRPD Chief Bruce Hite and Warren County Sheriff Daniel McEathron, the latter who was cited last month in EDA civil litigation due to his real estate business ties to McDonald – Hite is the sheriff’s brother-in- law. Sayre commented on what he said was a failure by FRPD to convey some information related to the McDonald home incident of June 15, 2017, to the commonwealth’s attorney’s office. Judge W. Dale Houff said there was no sense that McDonald would fabricate a report and there was no evidence that she did, and it was not believable that she would “set herself up” for a false report charge, a Class 1 misdemeanor. “The evidence is not sufficient,” he said. Had Houff seen the evidence, perhaps he would have reached a different decision in McDonald’s bench trial. Royal Examiner will begin publishing the entire investigative file this week; our readers will be able to follow the case from the reported break-in through to the point where the Virginia State Police take over the case. Watch Tom Sayre’s comments to the Board of Supervisors regarding the McDonald case and a conflict of interest between former Interim Chief Bruce Hite and Jennifer McDonald’s recently-revealed business partner, Sheriff Daniel McEathron. Roger Bianchini contributed to this report.